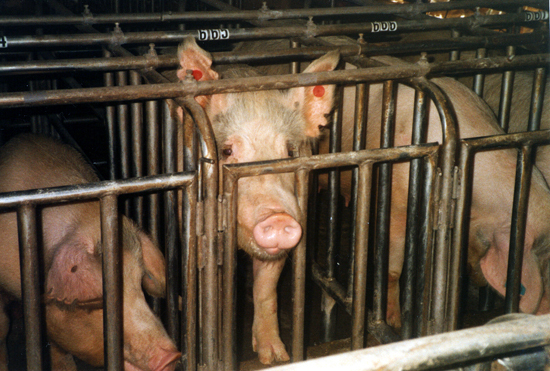 Factory farms have a lot to hide. We've all seen undercover footage exposing the horrendous treatment suffered by industry animals that a few brave individuals are able to bring light (as with the recent case involving dairy cow abuse by Central Valley Meat Co. in central California). Perhaps less obvious to the general public is the insidious environmental destruction that results from the massive amounts of waste produced by these operations. This waste degrades the surrounding land and surface waters in what most of us consider to be distant places. To local communities, however, the reality of factory farming is anything but hidden -- the smell, the flies, the foul brown water all seep through the land they call home. I recently had the opportunity to view firsthand the negative impact that factory farms have on the environment and their communities in eastern North Carolina. Farm Sanctuary's Bruce Friedrich (senior director for strategic initiatives), Nick Ugliuzza (our photographer and videographer), and I were invited as guests of Robert F. Kennedy's Waterkeeper Alliance, which provides support for communities standing up for their rights to clean water and for the wise and equitable use of water resources, both locally and globally. Among other laudable activities, Waterkeeper Alliance works to enforce Clean Water regulations by documenting water pollution and holding factory farms accountable. Waterkeeper staff member Larry Baldwin and volunteers Rick Dove and Joanne Somerday were our guides to some shocking sites. North Carolina is second only to Iowa in the number of hogs raised for meat in the United States, and it ranks second to Minnesota in slaughter of turkeys for meat. The chicken industry is also significant and expanding there; in fact, another large scale chicken facility is slated to be built in the state. The waste produced by these Concentrated Animal Feeding Operations (CAFOs) -- more aptly described as animal factories -- is overwhelming and destructive, and what we saw on our tour deeply saddened us. We flew over expansive manure "lagoons" on the properties of pig farms; we saw these operations spewing liquid pig manure onto fields, which then flows into surface water and pollutes the environment. Near a road outside one animal factory, we witnessed a cow standing chest deep in water laden with pig manure. We also observed sprinklers spraying liquid manure away from a farm, murky brown water flowing into a ditch, and miserable turkeys crammed into sheds almost the size of a football field. When we tried to speak with several "farm" owners about their methods and expansion plans, we were rebuffed. The local city council members who were called to meet with concerned citizens were either poorly informed, claiming ignorance about the chicken farm expansion plans, or worse, trying their best to curb any community-wide discussion about the issues. Case in point: The "heads-up" information on plans for expansion of these operations that should have been the starting point of an open dialogue with citizens was posted on a sign declaring that a new slaughterhouse was coming soon and that a meeting would be held to approve it. It's clear that agribusiness enjoys an imperious influence over town leaders and government policies wherever factory farming sets up shop. But the good news is that community activists are beginning to motivate their neighbors to take action. I was struck by how much courage the folks in one community had to speak up about the devastating effects of these animal factories. We spoke to two community activists who grew up in an area that includes factory farms, and they are fighting a chicken farm expansion. We also attended a town meeting with other members of the community who showed up to voice their opposition to a new factory farm. Big Agriculture is entrenched in North Carolina and in other states, and some people are clearly afraid to speak out. But these neighbors challenged the assumptions of local leaders that new (undesirable) jobs or perceived economic gains trump any concerns about the environment or quality of life. Not only are these folks noticing the problems and thinking for themselves, but they are taking the time and energy to voice their concerns to us and to local authorities. We also met a charismatic former pig farmer named Don Webb, whose neighbors confronted him about the air pollution caused by his pig-farming operation. One person after another spoke to him about the flies, the stench, and the fact that they could no longer enjoy being outside their homes. He told us that he thought of his parents: If something like this were happening to them, he realized that he would absolutely do his best to protect them from the problem. His neighbors effectively educated him about the harm he was causing, and he decided to get out of the business. His story is a testament to the fact that one person can make a difference by starting a conversation. This trip showed me that people in any community adversely affected by factory farming must gather their voices, stand up, and be heard! It takes courage and fortitude to challenge assumptions and educate your own neighbors, local business owners, and local government leaders. I was inspired to see people in North Carolina stepping up and taking a stand. This type of activism is never easy, but it's the only way local governments may begin to understand that the factory farming devastation must stop.